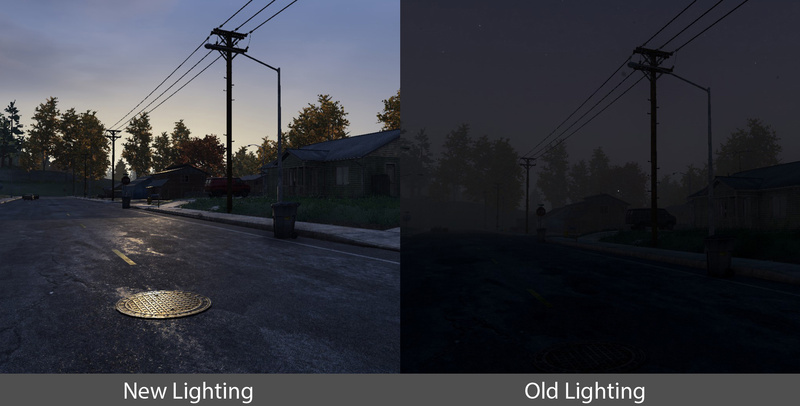 It’s fair to say that right now H1Z1 looks a little murky. But a recent post has shown off how the game will be looking pretty soon. 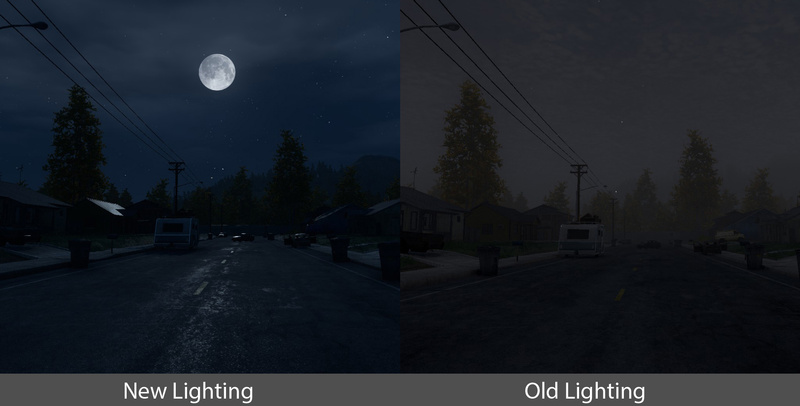 The team have said that they are working on implementing a new lighting system in to the game soon. How soon that means, we don’t actually know, but I’m hoping it means a couple of weeks soon. Anyway check out some of the new screens below – they look sweet! You can see a few more screenshots over in the post here. Along with a fancy new lighting system, there was also a pretty decent sized game update rolled out yesterday. The update included a full server wipe (goodbye loot!) and plenty of other changes and bug fixes. Here is a full list of what’s happened! •Fixed a bug where players can interrupt equip actions too quickly. •Fixed an issue where ammo count could become incorrect if you interrupt a reload action. 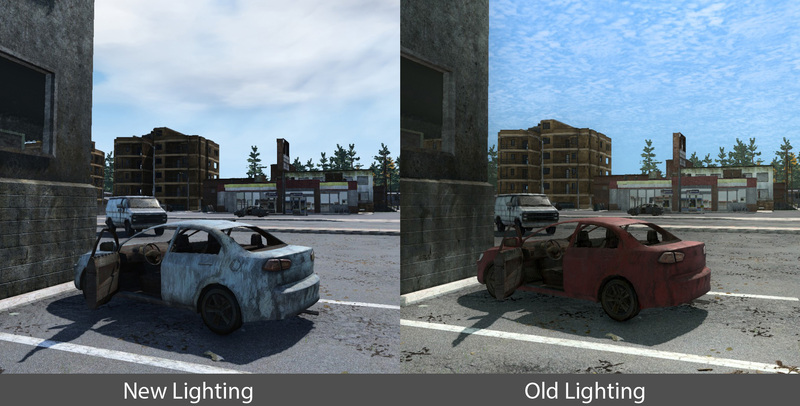 •Objects making noise above or below you in a multi-story building will now be properly attenuated. •Added slight zoom to all guns and bows in Iron Sight mode. •Lowered sway on .308 rifle while in scoped mode. •Fixed an issue with hydration burning too fast when stamina was full. •Dropping an item from a world container places it at the players feet instead of the world container origin. The latter would hide it in the world container model. •Vehicle stability adjustments – angular damping, moment of inertia, center of mass, tire friction and steering range tuning on the OffRoader, PickupTruck and PoliceCar. •Working on getting the vehicles to be more stable and less likely to abruptly roll or flip (this will still be possible on rocks, rough terrain, and player placed objects) but trying to make them more fun and survivable. •Fixed /respawn on PvE servers. •Fixed self-damage on PvE servers; the players may be the source of damage to themselves without mitigation. •Made players names reusable across servers. Names on each server must still be unique. •Battle Royale: Cleaned up gas after matches. •Battle Royale: gas damage reduced. •Fixed certain points of interest not getting reported when players entered. •Limited players to one character per server. •The makeshift shovel recipe now requires a metal sheet instead of a metal shard. •The storage container recipe now requires more materials. •The barbed wire recipe now requires wood planks and more metal shards. •The snare recipes now requires more metal shards. •The dew collector recipe now requires more wood planks and wood sticks. •The ground tiller recipe now requires more metal shards. •Bulk Changes – Many bulk changes have been made in an effort to meet somewhere in the middle of realistic and not annoying. •Canned food is 25 instead of 100. •All instances of water bottles are 25 instead of 50. •Backpacks are 150 instead of 600. •Military backpacks are 500 instead of 1400. •Car batteries 300 instead of 100. •Car fuel is 100 instead of 10. •Wood logs are 50 instead of 100. •Wood planks are 25 instead of 50. •Campfires are 50 instead of 100. •Scrap Metal is to 25 instead of 5. •Metal Sheets are 100 instead of 50. •Metal Pipes are 150 instead of 50. •Shirts are 50 instead of 100. •Jeans are 50 instead of 100. •Many melee weapons have had their bulk reduced. •First aid kits are 25 instead of 10. •All meat is 15 instead of 5. •Rifle ammo is 2 instead of 1. •Shotgun shells are 5 instead of 1. •Arrows are 5 instead of 1. •Shirts can now only hold 50 bulk instead of 90. •Pants can now only hold 50 bulk instead of 100. It’s good to see that some pretty big changes are already starting to happen, long may they continue!